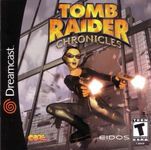 Tomb Raider Chronicles is the fifth game in the Tomb Raider series and the sequel to Tomb Raider: The Last Revelation. It was developed by Core Design and published by Eidos Interactive. The game was originally released in 2000 for PC, Sega Dreamcast and PlayStation. Source: Wikipedia, Tomb Raider Chronicles, available under the CC-BY-SA License.